One of the things I love about Dark Matter is that it’s incredibly consistent. Maybe not every episode will blow your mind, but it’s always solid. In its entire run, there’s been just one bad episode: that fembot mess from season one. That is, only one bad episode, until now. I fear it’s time to add another to the list. “Welcome to the Revolution” has a lot of cool ideas, and some scenes are very good, but it’s trying to do way too much, and the end result is confusing, half-baked, and downright damaging to the series going forward. While attempting to meet up with Tabor, their handler, the crew of the Raza once again finds themselves embroiled in corporate intrigue, as the local miners foment rebellion against their corporate overlords. It’s a story that’s eerily — and I believe intentionally — similar to the series premiere, but this time it’s far less black and white. The corporate soldiers aren’t all brutal tyrants, and the rebels aren’t entirely guiltless, either. At times they seem more villainous than their oppressors, in fact. And that part I liked. They managed to cram a lot of moral complexity into just one episode, and it once again shows that the Raza crew’s efforts to reinvent themselves as heroes will never be easy or simple. Again, being better is so much harder. 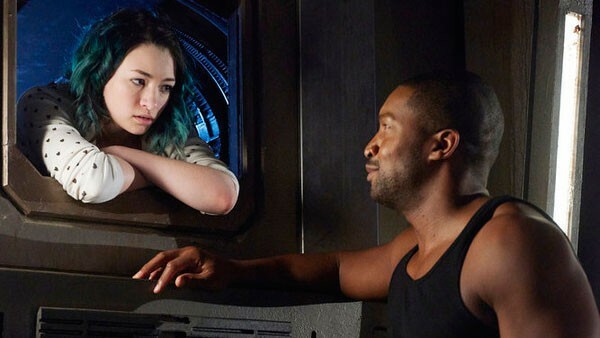 Things get even more interesting when a late twist ties the conflict into bigger plot arcs from Dark Matter’s past, but unfortunately, that’s also when things start to go off the rails. “Welcome to the Machine” is a complicated story, and there’s not nearly enough time to do it all justice. This needed to be a two-parter at least. But it isn’t, and so it feels rushed and unfinished, and the resolution honestly just doesn’t make sense given past context (this is a very hard episode to review without violating my spoiler policy). Ultimately, the goal of “Welcome to the Machine” seems to have been to provide another cast shake-up, and that’s the worst thing about it. The show has now lost one of its best characters, who has always been essential to its core themes, not to mention arguably its most talented actor. In exchange, the cast seems to have picked up two new characters. One has already proven himself finger-nails-on-a-chalkboard irritating, and the other could potentially be interesting but has yet to do much or display any real personality. This is not a good trade. 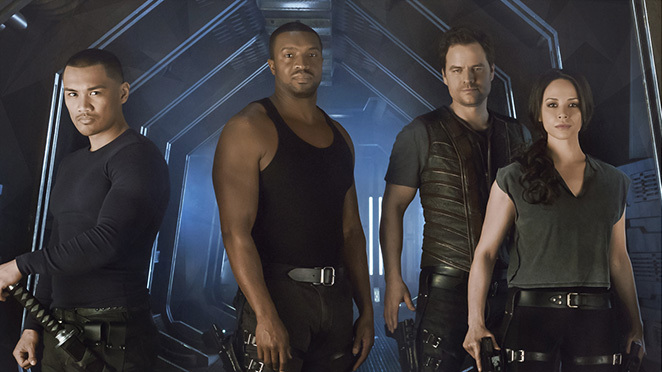 In general I am now growing frustrated with the extent to which Dark Matter hemorrhages cast members. I was never the biggest One fan, so I didn’t mind his death (though it’s disappointing that mystery was never solved), and the senselessness of Devon’s end was sort of the whole point of it, but Nyx and the latest loss are just examples of wasting potential. The show is worse for their loss. These losses are beginning to undermine the core themes of Dark Matter. It’s about the crew, about the unique family they’ve created with each other. The more those bonds are broken, the more the show loses its heart and soul. In other news, I’ve had some more articles published on MMO Bro. First, I imagine the possibility of a purely PvE survival sandbox, and how it could perhaps be superior to the PvP focused games currently dominating the genre. Interestingly I wrote this article before the Fortnite reveals at E3, but Fortnite seems pretty close to the PvE survival sandbox I was imagining (though smaller in scale than my hypotheticals). There’s still a lot of unanswered questions about Fortnite, but I gotta say the trailer made it look really fun, and it’s now on my radar. My main concern is that it seems like a game that’s really meant to be played with friends, but I don’t have a lot of gamer friends. It doesn’t seem like a good game for PUGing, and it’s not clear to me if playing solo is even an option, let alone an enjoyable playstyle. But I’m definitely going to keep an eye on it. Also at MMO Bro, I list off six ways World of Warcraft still has the rest of the MMO world beat. WoW is really showing its age these days, but there are a few specific areas it’s still trouncing the competition. This entry was posted in My writing, Reviews and tagged Dark Matter, fantasy, Fortnite, Oh god why, review, sci-fi, TV, video games, World of Warcraft, writing by Tyler F.M. Edwards. Bookmark the permalink.